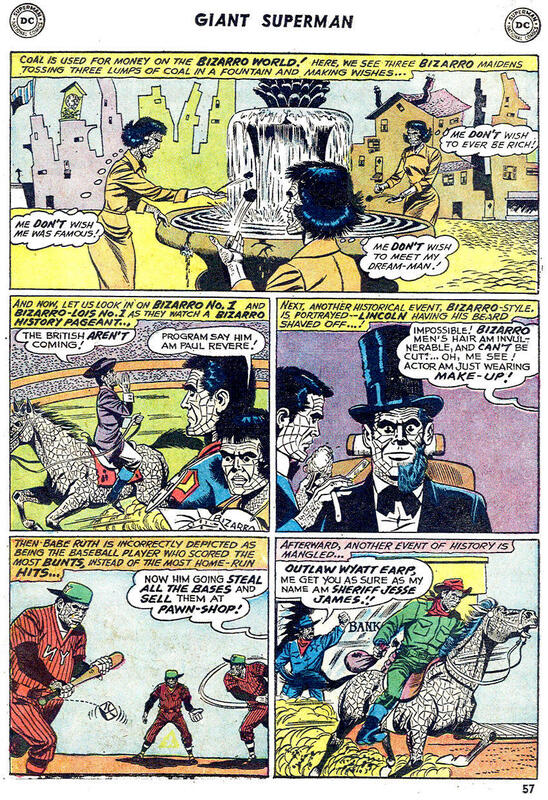 Pappy's Golden Age Comics Blogzine: Number 1617: Me love hate Bizarro! Number 1617: Me love hate Bizarro! 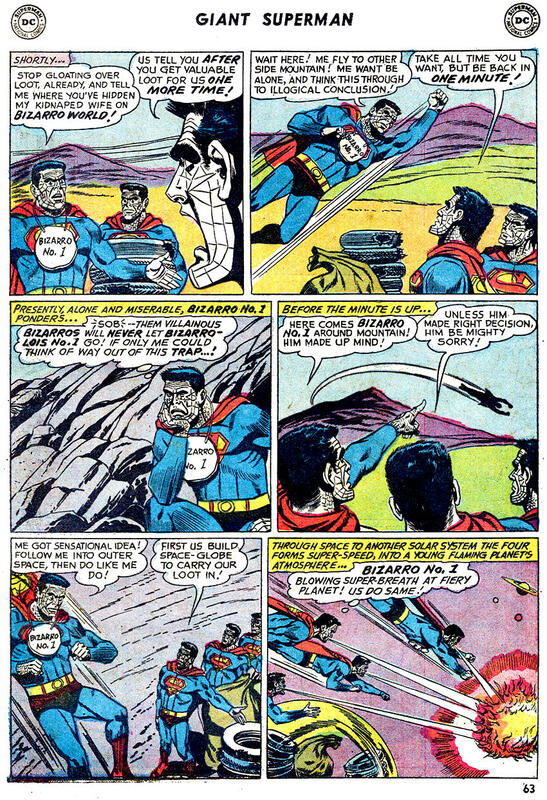 “Tales of the Bizarro World” — featuring stories of the defective Superman clones and characters of the Superman universe — was a big favorite of mine when it appeared in Adventure Comics in 1961-62. The idea of an inverted world has passed from Superman comic books into pop culture, even showing up on an episode of Seinfeld. 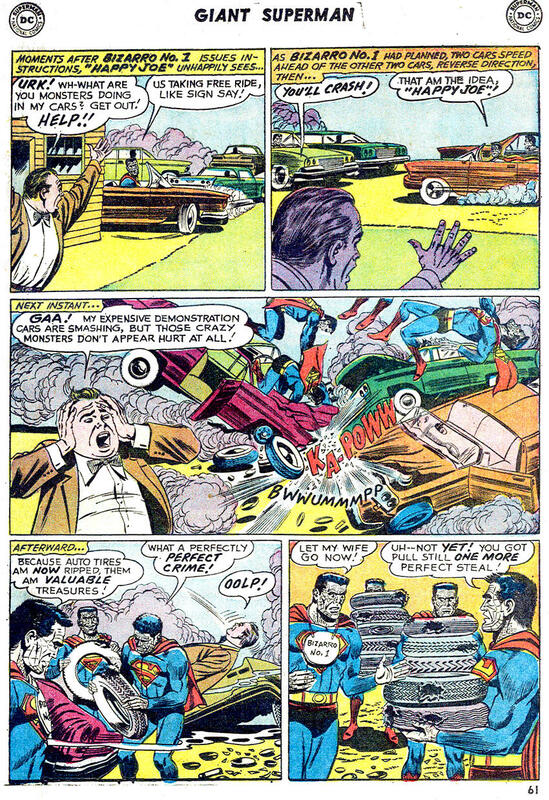 This story, which originally appeared in Adventure #291, was reprinted with several others in Superman #202 (1968), an 80-Page Giant issue, which used as its theme the topsy-turvy Bizarro World stories. (It is also the only silver age comic book I bought in 2013, when I searched my collection and could not find it. Me hate it when that happens!) 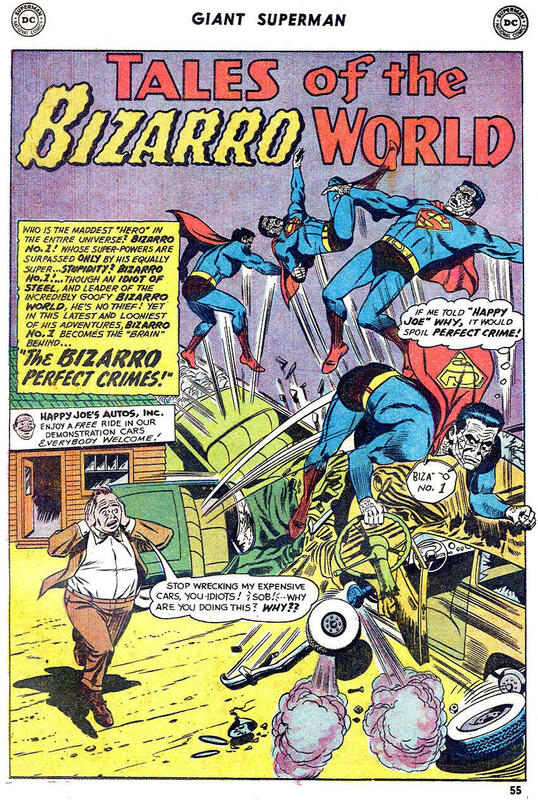 The Bizarro stories were also collected in a trade paperback a few years ago. 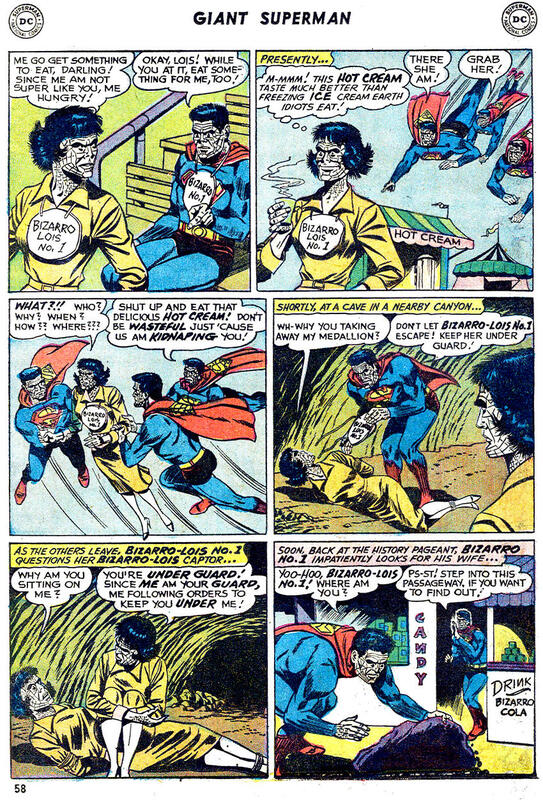 “The Bizarro Perfect Crimes” was written by Jerry Siegel and drawn by John Forte. At the time the series ended its 15 issue run I was extremely disappointed and stopped buying Adventure Comics, which means I missed out on the popular “Legion of Super Heroes” feature that took Bizarro’s spot. It went on to be a very collectible series. In that way it was a Bizarro thing for me to do. This is the second of our three-part Spacey Stories theme week. 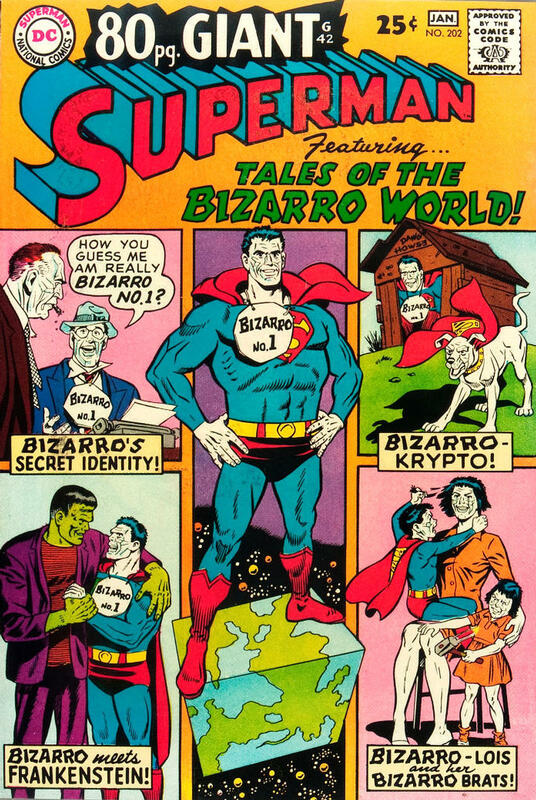 While a lot of the DC silver age stuff is fun, I never got Bizarro, and I think it's my analytic nature. For the stories to work -- and their central theme is that Bizarro's do everything backwards -- you still have to selectively do things forward so the reader can follow and understand the story. 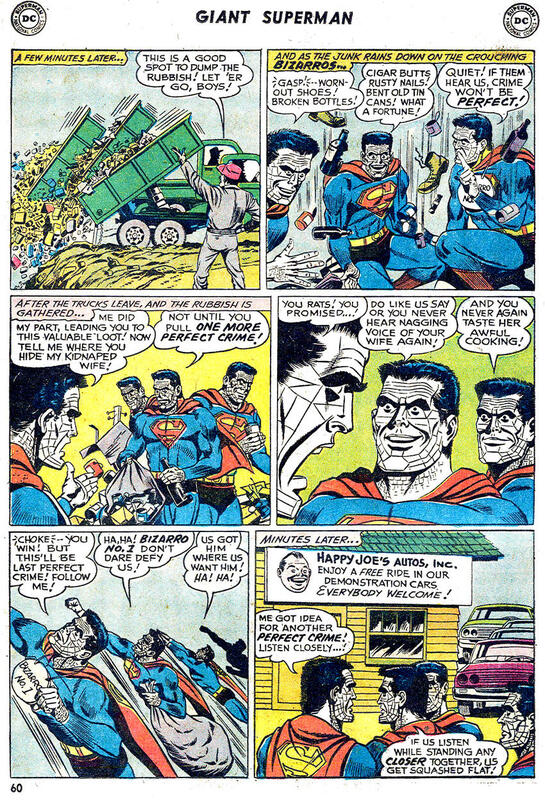 The "super criminal" Bizarro's ARE criminals, not good guys, as they should be (and this is even played up on the Jesse James history lesson.) I know it's silly, but I can never get over just how selective the Bizarro stories are about what's backwards! Of course, Moore handled this perfectly in "Whatever Happened to the Man of Tomorrow." Brian, if you want consistency you need to look elsewhere. Personally, it doesn’t bother me at all, although I noticed it even when the series was first published. 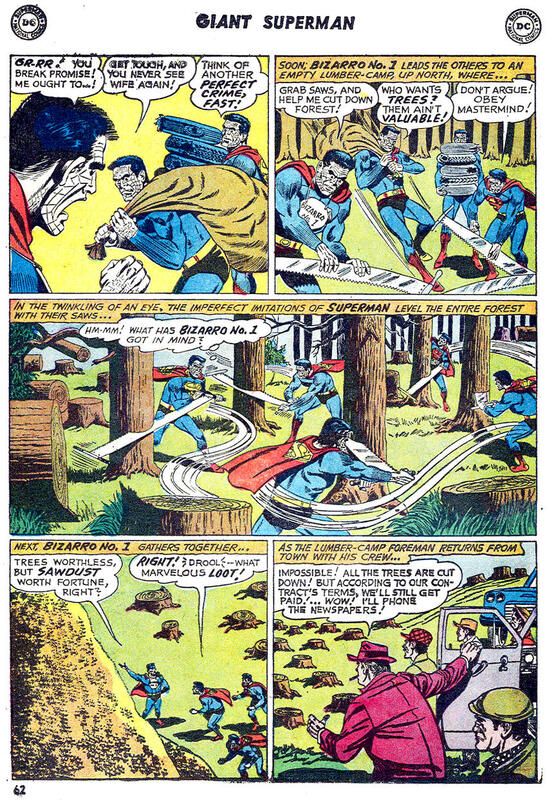 At the time I was also reading Superman family comics which had their own problems. 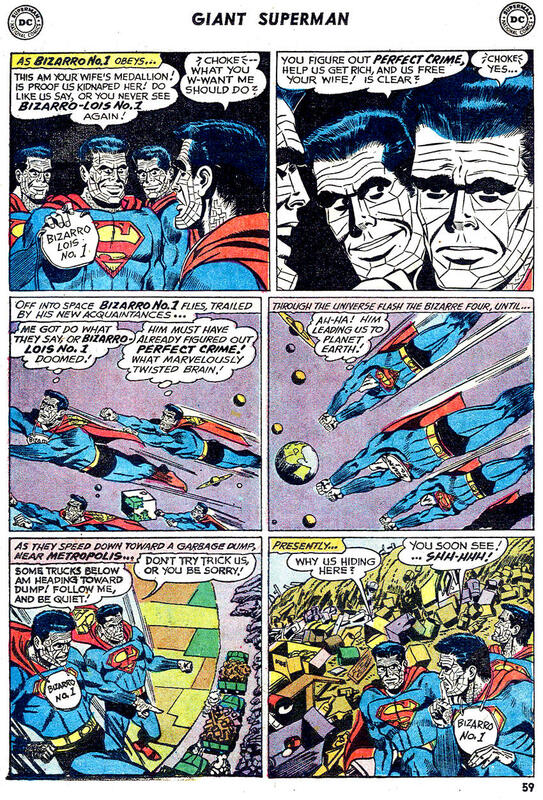 To serve the plot they sometimes featured new super powers for Superman, or things that were physically impossible (Superman picking up buildings or mountains without them collapsing) and then there was the kryptonite that came in whatever color was deemed necessary for the screwball plots. There were the so-called "imaginary stories," which I found annoying. 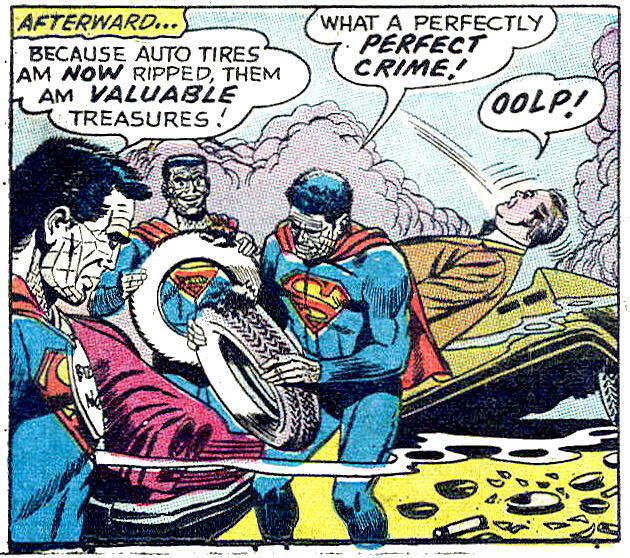 Next to all of those even the Bizarro stories made a weird kind of sense. 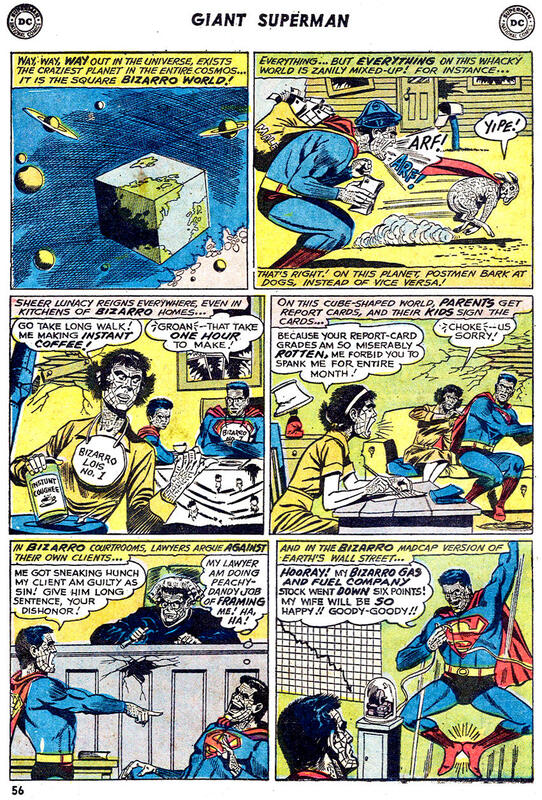 Unlike the usual Superman fare, which had a deadpan seriousness, "Tales From the Bizarro World" were designed to be funny, and this reader thought they were. I really enjoyed this story. 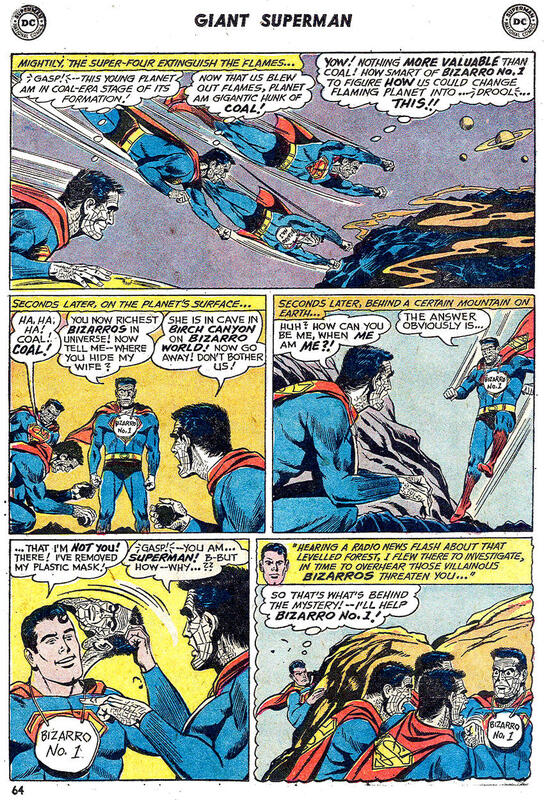 I'd like to see some more Golden Age Superman, if you have some please. I really enjoyed John Forte's art on these. He had such a tight brush! 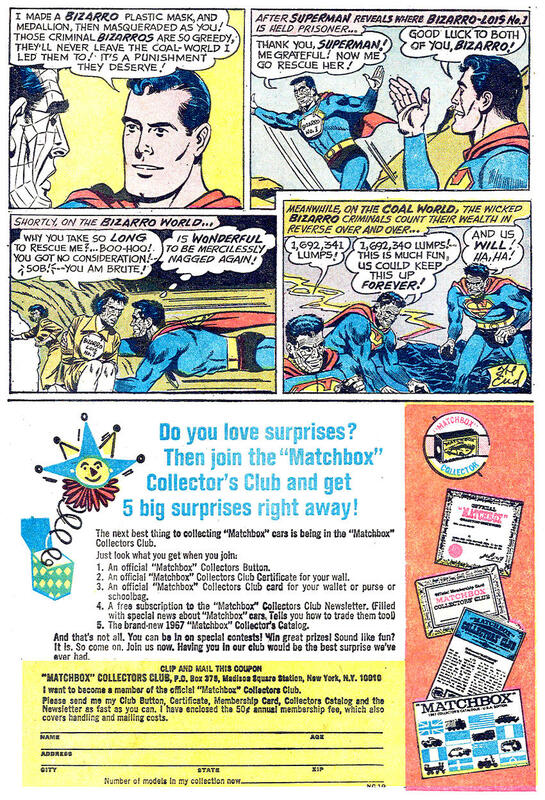 I wish he had inked Curt Swan more. The few times he did, he added an intensity I enjoyed. Number 1613: Frankenstein’s terror under trance!